First transceiver with customizable filter shapes. There were no optional filters to buy, for none were needed. For the new IC-756PROIII, Icom’s combined the cutting-edge receiver technology of the IC-7800 with the familiar ergonomics of the IC-756PROII. Take your DXing to the next level with Icom’s IC-756PROIII. Using receiver design techniques introduced in the IC-7800, Icom’s engineering team focused on producing a distortion-free, high-dynamic-range. To achieve this goal, Icom used higher-grade components in vital receiver sections of the IC- 756PROIII. The IC-756PROIII uses large inductors instead of small coils in the bandpass filter (BPF) stage, because small coils sometimes cause magnetic saturation in the BPF stage. Large inductors can handle both strong signals and weak signals with lower distortion. The BPF switching circuitry is one of the critical points in a receiver where distortion can be produced by strong out-of-band signals. Distortion at this early receiver stage then propagates throughout the remaining stages and cannot be removed by signal processing. The IC-756PROIII uses low distortion diodes with wide frequency characteristics that prevent formation of distortion components in the BPF stage. The IC-756PROIII uses a fundamentalmode monolithic crystal filter for the roofing filter. Although it’s more expensive than overtone-mode filters, the fundamentalmode filter has a better shape factor and is less susceptible to intermodulation distortion under strongsignal conditions. This is the same 15kHz crystal filter used in the IC-7800 roofing filter circuit. To minimize distortion and maximize dynamic range, the IC-756PROIII preamplifiers use the same basic circuit design as the IC-7800 preamplifiers. Preamp-1 is a noiseless feedback design, with push-pull amplifiers. This design has a high intercept point and covers a wide frequency range. Preamp-2, which uses bipolar transistors for higher gain, is ideal when you use separate low-efficiency receiving antennas such as small loops or Beverages. The real time spectrum scope is now an indispensable tool for top performing HF radios. The IC-756PROIII’s spectrum scope adds a mini scope function, as requested by many PROII users. The mini scope allows you to monitor the scope screen while you use other function menus. For example, you can monitor the scope screen even while you are changing the IF filter shape and passband width. The scope range can be set in 4 steps ±12.5 kHz, ±25 kHz, ±50 kHz and ±100 kHz, centered onthe receiving frequency. In addition, the spectrum scope has 3 attenuator levels (10dB, 20dB and 30dB). The IC-756PROIII has 8 channels of RTTY transmit memory. You can edit and send up to a 62 character message for each memory channel without a PC or other external unit*. The transmit memory is displayed on the screen so you won’t send the wrong message. The built-in RTTY demodulator and decoder allow you to check the callsign of the station on the air instantly. A PC or external unit is not also necessary. * When writing and sending RTTY messages on site, a Terminal Unit, TNC or PC and dedicated software is required. The SSB transmit bandwidth is selectable from 100, 300 and 500Hz at the high-pass edge, and 2500, 2700 and 2900Hz at the low-pass edge respectively. 3 types of high and low combinations can be stored in the memory. In addition, the built-in audio equalizer has separate bass and treble adjustments for a total of 121 combinations, so you can tone your voice up or down as you want. With this flexible DSP-based waveform shaping, you can tailor your transmit audio quality to suit your operating style. New 60 meter band coverage, equivalent transmit power and antenna tuner capabilities to the other bands. The heart of the IC-756PROIII is the proven combination of the 32-bit floating point DSP and 24-bit AD/DA converters. This powerful combination supports many digital processing features exclusive to the IC-756PROIII, which cannot be achieved with traditional analog processors. The 24- bit AD/DA converter has an ultra-wide dynamic range. The receiver delivers a distortion- free, clear sound in any signal condition, from a weak signal to a strong full power station. The digital IF filter and manual notch filter are included in the AGC loop driven by the DSP. This architecture completely eliminates“AGC pumping” caused by adjacent strong signals out of the IF filter passband. In addition, programmable AGC time constants* (slow, medium, and fast presets) give flexibility and speed needed for working the pile-ups. The dual watch* function allows you to receive 2 signals on the same band simultaneously. You can listen to your favorite net while keeping an eye or ear on the DX station. The signal strength balance between the main and sub frequencies is adjustable from the balance knob. DSP-based twin passband tuning (PBT) helps eliminate interference by changing the IF filter bandwidth and/or shifting the center frequency. With the digital IF filters, the PBT performance allows you to cut away all the interference and noise to hear the actual signal. The LCD indicates the twin PBT conditions across the top of the screen. An incredible 70dB of attenuation is at your command with the manual notch. Eliminate strong adjacent signals or beat tone noise, without reducing the performance of the AGC gain. Select an appropriate filter shape that favors your operating style or band conditions. Independent SSB and CW filter gives you the flexibility. The perfect filter shape factor when signal fidelity or pinpoint accuracy is needed! A sharp slope from the filter edges gives full audio response while eliminating any adjacent interference. The “too good to be true” CW filter! The steep filter skirts — only 200Hz from the –6dB to the –60dB points — allow you to hear a weak CW signal that is surrounded by strong ones. DX hunters will have to try this one to really see the magic of the Sharp CW filter. The perfect filter shape factor when trying to pick out a weak signal! The rounded filter shape resembles a traditional analog filter, by rolling off the high and low ends of the passband. Although maintaining the steep filter skirt characteristics of a digital filter, the soft filter increases the signal-to noise ratio of the intended signal. Running a pile-up has become easier with the soft CW filter. By broadening the filter skirt, the characteristics of the soft filter perform much like a mechanical filter without the ringing. Eliminate annoying AM carriers, amplifier or radio tune up interference with a push of a button. 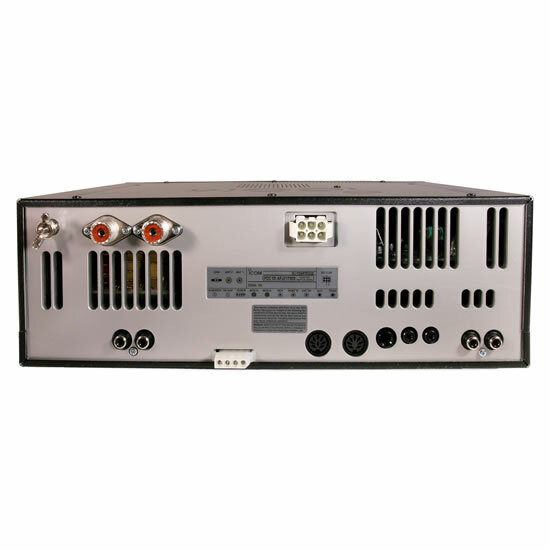 The automatic notch tracks 2 or more interfering signals simultaneously without intended signal loss or distortion. Very helpful on 80 and 160 meters. The 32-bit DSP processing power produces real results by separating signal components from the noise with the variable Noise Reduction. By suppressing the noise components, an outstanding Signalto- noise ratio is achieved, providing clear, clean audio in all modes without distortion of the target signal. Reduce annoying QRN from pulse-type noise such as engine ignition systems and sparking appliance motors, with the fully adjustable (101 steps) noise blanker. The Digital Voice Recorder (DVR) is a very convenient function for contests, DXpeditions and even normal operation. Record your callsign, CQ, or other station information into four memory locations. A total of 90 seconds is available for the four memories, with each memory channel being soft partitioned to allow custom recording sizes. A quick push of the front-panel DVR button allows you to record received signal into the R4 memory. The playback automatically mutes the receiver for clear playback of the previous 15 seconds of recorded audio. The perfect feature for those contest operators wanting to improve their UBN. A must have feature for the CW operator, the internal memory keyer provides 4 memories for programming station information, calling CQ and callsign. Each memory has a capacity of 55 characters, as well as other time saving functions such as automatic automatic repeat, serial contest number autocounter, and morse cut number functions. The IC-756PROIII utilizes the 32-bit DSP for the RF speech compressor providing the maximum punch without the fuzzy sound. Great for breaking through the noise and hash to complete the QSO. For a big, clear signal, the IC-756PROIII uses two 2SC5125 transistors in the PA Unit. Along with superior IMD characteristics, these transistors have plenty of power to allow for 100W full duty cycle operation. Advanced design considerations along with an aluminum, die-cast frame, and large cooling fan, help to stabilize the PA circuit providing full duty cycle operation. The IC-756PROIII incorporates a high-stability master oscillator, providing ±0.5ppm (–10ºC to +50ºC). A must for RTTY, SSTV or M A R S operation. Hop around the band with Icom’s exclusive triple band stacking registers. Each band remembers the last 3 frequencies, mode and other settings used. When the IF filter passband is reduced to 500Hz or less in SSB/SSB data mode, special bandpass filters are automatically selected. The BPF automatically sharpen for better rejection of interfering signals. Along with the BPF, the IC-756PROIII automatically turns off the compression and enables the 1/4-tuning step for easier operation and more accurate tuning. Perfect for PSK31, SSTV or other AFSK modes. Enjoy the full 5-inch TFT color display. 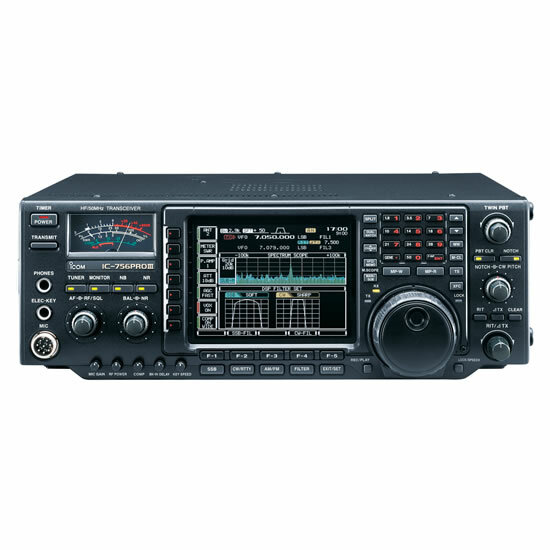 The IC-756PROIII has 8 colors of display settings and 7 types of font settings. Various information is indicated on the color LCD, separated into an upper and lower screen. The lower screen can spread vertically to increase the information viewing area.